I found something similar from Ichigo (ichigoshoes.multiply.com) for P1,450. These are totally cute, but for me it's overkill. I would not wear this at all, except for maybe a costume party. But then there are certain people who would look great, shockingly inspirational and attention worthy wearing this. Ashley, Vanessa and Kirsten in glads. (left) from trunkshow for P750; Available in gold and white. (r) Hayden wearing an original Coach glads. 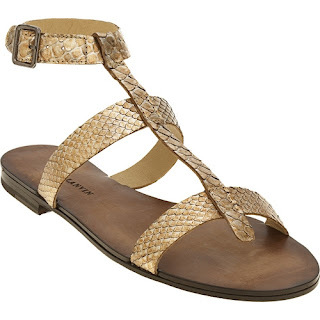 You may also find fab affordable gladiator sandals in Schu, PRP and Janylin. But it's definitely cheaper to buy online. Most glads online are priced below P1K:) As for me, here's my first gladiator buy which I absoluuutely fabulously love! *Taro gladiator sandals from Ichigoshoes.